Hillary Clinton made a surprise cameo appearance on the premiere of the “Murphy Brown” revival Thursday night, making several jokes at her own expense. 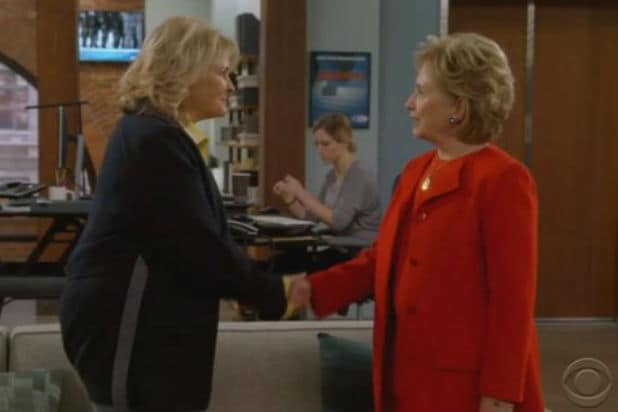 At the beginning of the episode, Candice Bergen’s Murphy Brown interviews a new candidate for a “secretarial position.” Enter Hillary, who says she spells her name with just one “L,” and insists she just looks like the ex-Secretary of State. “Hilary” references one of Hillary Clinton’s 2016 campaign blurbs, saying “I’m qualified, and I’m ready on day one,” and quips that she has “some experience with emails.” The she adds that her experience includes four years as a secretary in “a very large organization.” And of course, “Hilary” also references one of Clinton’s books, saying that in a TV news production, “everyone works together. It takes a village.” Wokka wokka wokka. On Oct. 7, Clinton will also appear in the season premiere of “Madam Secretary,” alongside fellow former Secretaries of State Madeleine Albright and Colin Powell. The cameo was announced back in July. The revival of “Murphy Brown” reunites Bergen, also an executive producer, with series creator and executive producer Diane English and original series co-stars Faith Ford, Joe Regalbuto and Grant Shaud. As it did in the original run, “Murphy Brown” will tackle the current political climate, which will include references to President Donald Trump, his press secretary Sarah Huckabee Sanders and a “Steve Bannon-esque” character, among others. English also said the show will do a #MeToo inspired storyline in the fourth episode.